Kangana Ranaut has been spitting fire against Bollyoowd since the fraternity showed no compassion or support to her film, Manikarnika: The Queen of Jhansi, in January 2019. Her latest jibe is at Alia Bhatt. Again. Recently, Kangana won the best actress poll ran by BollywoodLife, for her performance in Manikarnika, beating Alia's turn in Gully Boy. When the entertainment portal got in touch with Kangana for a comment on the same, she had some fiery comments. "I am embarrassed...What is there to beat in Gully Boy performance," she asked. Well, this sentence alone is enough to ruffle feathers in Bollywood. But there's more. Kangana Ranaut Is Against Calling Ranbir Kapoor and Alia Bhatt 'Young', Says 'Are They Kids or Are They Dumb?'. 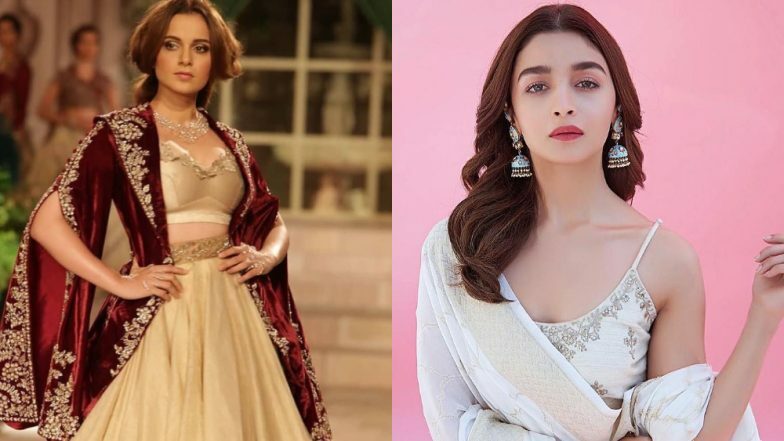 Kangana further added, describing Alia's performance, "same snappy muh phat girl... Bollywood’s idea of a fiery girl, woman empowerment and good acting, spare me this embarrassment, please,"
"Media have taken filmy kids love too far. Stop pampering mediocre work or else bar will never be raised," she concluded. Ouch! BTW, in the said poll, Kangana had received 37% votes, while Alia came in second with 33% votes. What do you think? Will Alia choose to respond to this comment? Do you agree with Kangana said? Let us get the conversation going, now that it has been started. Tweet to us @latestly. Alia Bhatt in Gully Boy, Kangana Ranaut in Manikarnika, Sonam Kapoor in Ek Ladki Ko Dekha Toh Aisa Laga - Which Actress Impressed the Most in the First Quarter of 2019. On the professional front, Kangana will next star in Mental Hai Kya with Rajkummar Rao, while Alia's next film is Kalank alongside Varun Dhawan, Sonakshi Sharma, Aditya Roy Kapur, Madhuri Dixit and Sanjay Dutt. Also, while Kangana has Panga and Thalaivi, AL Vijay's J Jayalalithaa biopic, Alia will star in Brahmastra, RRR, Inshallah and Takht.